Himalayan blackberries may steal most of the culinary applause 'round here and everywhere else, but the Pacific Northwest—besides being a mushroom magnet—is home to many other delicious berries, most of them native. If you live in the Puget Sound region, my advice is to get outside NOW and scour lowland woods. Though not as prolific as the invasive Himalayan, these impish blackberries are native to the Pacific Northwest, have excellent flavor, and their appearance is more pleasing to me. Himalayas are the Mark McGuires of the blackberry world: pumped up to the point of raising suspicion. Trailing blackberries are the Ken Griffey, Jr.'s, circa 1995: lean, defined, with pop and a winning smile. I use Himalayas for my baking. You need a lot of berries to make a pie or cobbler and the Himalayas are good for that. (Hint: if, for aesthetic reasons, you want a few of the Himalayas to keep their shape even after cooking, make sure you pick a handful of red or under-ripe ones.) The trailing blackberries, on the other hand, I prefer to eat fresh. Look for trailing blackberries in areas of disturbance: clearcuts, burns, slides. They're common in second-growth forests, especially along trails. Red huckleberries (Vaccinium parvifolium), another native Northwest berry, are the first huckleberries in the region to ripen. Crops can vary considerably from year to year, and even in a good year, such as this one, there's significant variation in the size of berries from bush to bush. It pays to scout for bushes with larger berries. And the bushes can be quite tall for huckleberries—up to 4 meters high. 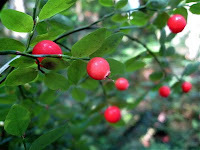 Look for red huckleberries in lowland coniferous and mixed forests. Admittedly, picking huckleberries can be tedious work, so relax, get comfortable, and just soak up the atmosphere of the woods while you pick. On this day I had winter wrens, vireos, and an opinionated Pacific-slope flycatcher to keep me company. Summertime, especially when it's hot out, is made for fresh, local ingredients simply prepared. Who wants to spend a lot of time in the kitchen when the mercury's topping 90 degrees—or 100 for that matter? I love summer pastas with tomatoes, garlic, and basil cooked merely by the heat of the pasta. 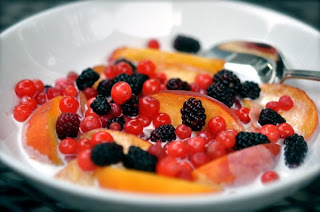 Similarly, a dessert of fresh fruits bathed only in a little cream (or half 'n' half, as was the case) is a perfect way to enjoy the season's sweet treats. For this one we used Berryman's Twin Springs Farms peaches along with trailing blackberries and red huckleberries gathered mere hours earlier. Great colors, even greater taste. what a great selection of berries to find! Beautiful! I've got to get out and get some blackberries this weekend. I just read, but haven't yet tried, another tip for getting some of the berries to retain shape after baking: simply wait until the last ten minutes of baking and then add a few more berries on top. I think it might have been in an Alice Water's book but I'm not sure. I'm so happy to see someone validate my preference for the low-growing blackberry. I'm not a fan of the Himalaya, having grown up eating the smaller berry. They also make spectacular jam. 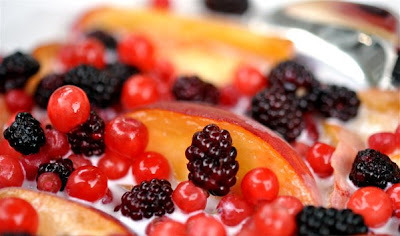 Lang, you've got some beautiful photographs going on - mixed wild berries are pretty scrumptious subjects. Delectable visions. Picking the neighborhood blackberries is an August rite of passage here, Mark McGuire-ish though they may be. Hey all, thanks for the comments. Been off the grid up in B.C. (post soon). 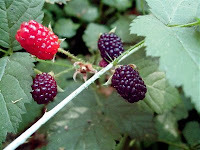 Ciao Chow Linda - It's berry time in the PacNW, wild and otherwise. All the u-pick places are going gangbusters right now. Michael - Good tip. Of course, becomes tricky with pies, cobblers, and other desserts with crusty tops. sheepish@rio.com - Thanks for dropping by. I'm a fan of all the blackberry varieties, but the native trailing variety certainly has its staunch partisans. Sally - The Mark McGuire comment might be a bit unfair. We shouldn't feel guilty for loving Himalayan blackberries! Love this post, spreading the good wild berry word...so much available beyond the himalayan. Congrats on the Seattle Weekly Best Blog Award! That is so awesome. Thanks for the post. 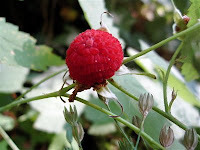 Now I'm wondering if the wild berry bush in my neighbor's side yard is a thimbleberry rather than a raspberry like I'd first thought. Any idea if thimbleberries are more likely to pop up wild? Visit my dedicated web site, LangdonCook.com, for more detailed information on classes, events, readings, and other good stuff. Click here for classes and events. Author of award-winning The Mushroom Hunters and Fat of the Land, Langdon Cook is a writer, instructor, and lecturer on wild foods and the outdoors. Cook has been profiled in Bon Appetit, WSJ magazine, and Salon.com, and his writing has appeared in numerous magazines, newspapers, and online journals. His on-screen credits include the PBS TV series "Food Forward" and The Travel Channel's "Trip Flip."